Church steeple in village in background? Sewage Farm Newbury RDC shown on 1932 1:10560 Ordnance Survey map. Writing on vehicle says: SIR ALAN COBHAM'S AIR DISPLAY. Eureka! Writing on bus says: SIR ALAN COBHAM'S AIR DISPLAY. A rather super sized haystack. Another photo of this plane taken over Norfolk. see the pilots faces. One would assume this is a "Trainer" with obviously two sets of controls, if not then normally the passenger sits in the front with the pilot behind. Could this be Sir Alan Cobham. He was known for preaching about flight and it looks like a profile shot of him from Flight in Oct 1933. This reads 'Sir Alan Cobham uses Dunlop Tyres' Sir Alan Cobham set up National Aviation Days (AKA Cobham's Flying Circus) in 1932 touring the country to bring 'air-mindedness' to the population. Banner which appears to read 'Grand Naval & Military Display'. There is more writing but I am unable to decipher it. Great Western Railway Line known as the Berks & Hants from Paddington and Reading to Newbury, Westbury and the West Country. Does anyone have a complete list of the 1933 venues for the National Aviation Days? I have yet to find one. EUREKA Please allow me a feeling of elation as I have now identified the location of these three photos which are of Thatcham looking eastward from Thatcham Farm towards Thatcham Station presumably on 28th April 1933 when the National Aviation Day visited Newbury. EPW041021, EPW041022 and EPW041023 are of the same location which is Thatcham Farm looking east towards Thatcham Station. Alan Cobham's 'National Aviation Day' displays in the UK in April 1933. Two tours operated simultaneously in the summer in the UK. These dates might help narrow down the location? "In 1933 the National Aviation Day programme was split into No 1 and No 2 Tours, with No 1 Tour beginning at Dagenham on April 15 and No 2 Tour starting at Southend on the previous day. For part of the season at least, G-ABSI flew with No 1 Tour and G-ABSJ flew with No 2 Tour. On April 20 No 2 Tour visited Hertford. It was a warm, wet day and I remember seeing the display formation flight over the town—my first view of the Airspeed Ferry. According to Cobham's list of towns visited in 1933, No 1 Tour was at Welwyn on April 26." Planes flying: G-EBHE and G-EBGZ. Planes on ground: G-ACEZ and G-EBYH, plus three at bottom of frame with numbers not visible. Most of the spectators are waving. Perhaps they were told the photograph was being taken for posterity? Was this one of the final events culminating in the Trafalgar Sq fly past? visit http://www.flightglobal.com/pdfarchive/view/1933/1933%20-%200724.html for more possible locations. 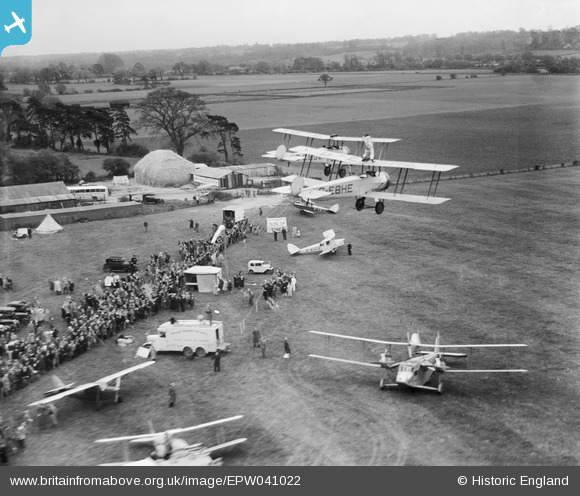 The last of Sir Alan Cobham's National Aviation Days in 1933 took place in Romford in October. Could this be Romford? This has the feel of somewhere in the Thames valley. I think that the fencing on the railway line is characteristic of the Great Western Railway.